Making sense of OMD Group's performance is hard because it includes OMD UK, Manning Gottlieb OMD and M2M - three subsidiaries that generate close to £1 billion in billings among them. For all these agencies, it felt like a good, rather than great, year. OMD did well with Channel 4 – its campaign for Humans swept the Media Week Awards – yet there was no standout new-business win and it resigned the valuable Coty account. MG OMD’s golden run with John Lewis continued, but it declined to repitch for Virgin Atlantic after 22 years – only to see the business bounce around from Arena Media to its sister agency PHD. And M2M suffered a crushing blow when Lidl moved its £50 million-plus account (hopefully the success of Paddy Power’s "rainbow laces" campaign at the Media Week Awards put smiles back on faces). Big-spenders such as McDonald’s and Virgin Media have provided a steady income, in addition to 22 accounts wins, which included a confidential £15 million piece of business. OMD Group’s federated structure means that the agencies can invest in their own identities. OMD UK launched an outreach programme for media owners and a scheme enabling staff to work in different parts of the agency. MG OMD was named Thinkbox’s most-awarded agency of the past decade and pushed its entry-level MG Academy. M2M ran "inspiration sessions", launched its own newspaper and supported employees’ passions. All in all, it was a mixed year for the group but one with some good stuff to be proud of. "OMD UK launched its new proposition and won 70 awards, including four golds, a silver, a bronze and the Grand Prix at the Media Week Awards. 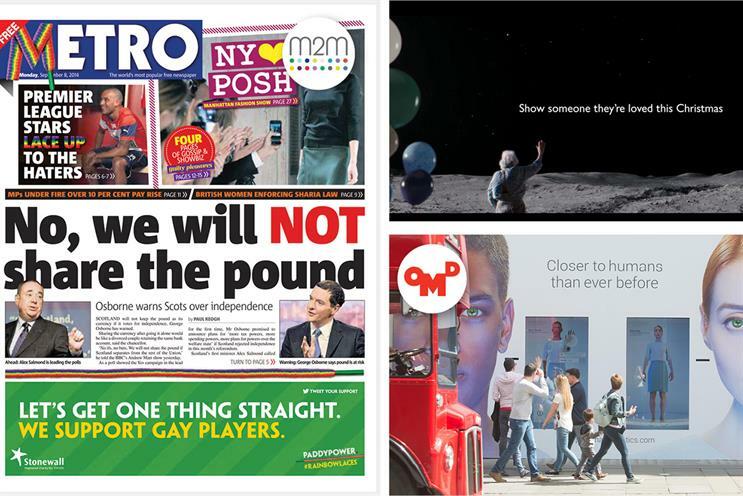 MG OMD delivered iconic campaigns including Bond and the John Lewis Christmas tear-jerker. Also won 46 awards including gold at the Media Week Awards. A new structure, vision and purpose helped M2M win seven accounts and numerous awards, including two golds and a silver at the Media Week Awards."